Janet Todd is the author of the new novel A Man of Genius. Her many other books include Jane Austen: Her Life, Her Times, Her Novels and Mary Wollstonecraft: A Revolutionary Life. 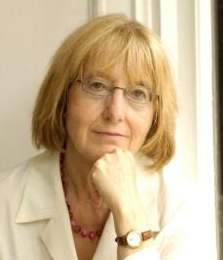 She is a professor emerita at the University of Aberdeen and honorary fellow of Newnham College, as well as a former president of Lucy Cavendish College, Cambridge. She lives in Cambridge and Venice. Q: How did you come up with the idea for A Man of Genius, and why did you decide to have your main character Ann be a writer of Gothic novels? A: I like a mystery. I wanted to tell a Gothic story that would take place when Gothic fiction was hugely popular: the early 19th century. I wanted my heroine to be a writer of novels who would find herself in a fictional Gothic plot–without any more understanding of what to do than the naive young heroines she described. I have recently edited the works of Jane Austen from this period and written a biography that included Mary Shelley, also writing during this time. My main character is quite different from these now celebrated writers and is typical of the crowd of largely forgotten women who fed the increasing taste for Gothic fiction. These women rarely had a sense of themselves as “authors” in the way that Austen or Shelley had. Rather, they were jobbing writers who wrote quickly and repetitively for money. Very often they apologised for going into print at all but insisted they did it because they had to keep themselves and often a family when a father or husband had died or deserted them. To make a reasonable living they had to write quickly and feed the readers’ desire for more and more sensation, hence the repetition and the recycling of plots and characters. Men as well as women wrote these novels but, though the numbers of practitioners was fairly equal during the years, women on average wrote more books than men; so it’s fair to say that they dominated the form. Jane Austen has her hero in Northanger Abbey admire Ann Radcliffe, the queen of the genre, but her heroines read both Radcliffe and her much less skilled followers before being laughed out of their enthusiasm by the better educated heroes. Gothic novels were not just cheap mind fodder. Like no other genre the Gothic could speak, in crude as well as sometimes sophisticated ways, to women’s hidden fears of men, their own bodies and of the cultural expectations they only partly understood. The fears were both sexual and psychological. Q: How was the book’s title suggested, and what does it signify for you? A: While women were beavering away writing mainly fiction to sell in the marketplace, there arose the notion of the “man of genius.” The idea exists before and after the early 19th century but this is the period when it came especially to the fore. The French Revolution dominated the 1790s when my characters were growing up. It inspired many radicals to imagine revolution or at least great social change in England as well as France. By the 1810s when most of the novel is set, this enthusiastic period is well and truly over. After 22 years of almost constant war between Britain and France, the battle of Waterloo in 1815 ended the struggle, with England victorious. The revolutionary hopes for change were dashed. Most of the action of A Man of Genius takes place in the troubled period following the end of war, when once radical or liberal people were disillusioned about politics and were putting faith in the notion of great individuals. Men of genius who spoke to the individual as well as to society and whose message was for inner transformation rather than outer were a powerful force. Such men believed inordinately in themselves and appealed to followers; both men and women were excited to be in their orbit and listen to them speak. These writers were not at all like women Gothic novelists, but felt themselves divinely inspired or at least in touch with something transcendent. They wrote with enthusiasm, almost from revelation, rather than with persistence and hard work. Although they did of course revise, the image they projected was of sudden insight. My main male character, Robert, is not modelled on the “real geniuses” such as Shelley and Byron but the adulation they inspired, especially from the women about them, and the liberty of sexual and social behaviour they allowed themselves are part of the air he breathes. My questions is: what happens when inspiration fades or when it becomes obvious that no words can express the internal vision? How does the man of genius react? How do his followers and lovers? Q: Why did you decide on Venice as the setting for many of the book’s key events, and how important is setting to you in your writing? A: I chose Venice especially for its extraordinary appearance and for its history. The English had long been fascinated by Venice and it formed an essential part of the 18th-century gentleman’s grand tour. But in the period of my book it had fallen from its period of glory and where England defeated Napoleon’s France, Venice had been ignominiously defeated by Napoleon, who ended in a flash its thousand years of proud, independent existence. By the time my main characters arrived in the city it had been annexed by Austria. Although there was plotting and intriguing among its citizens, Venice would never again be an independent imperial power. After it had dusted itself down, it would learn to live through tourism. But that comes later. I wanted my characters to visit in the period of shabbiness and decay. My heroine Ann in particular responds to the strange, uncomfortable but still alluring city. I’m fascinated both by the real Venice where I stay for part of the year and by its many past incarnations and representations. In my book I touch on the art of Titian and other painters both because it forms a major part of the city and because it allows contrast between the glorious Renaissance and the book’s diminished present. Venice is a city that’s always changing and yet remains so much the same, always about to be flooded by the Adriatic and yet never quite submerged. Q: Did you know how the novel would end before you started writing, or did you make many changes as you went along? A: I knew where I wanted to get to but wasn’t quite sure at the start how to entwine my two plots: of Ann’s mysterious origins and of the mutual tormenting relationship at the heart of the book. But I think I got there! I connected both through the theme and imagery of memory. This fascinates me a good deal—what a person remembers and has been told and how the two may merge, how much childhood memories and images influence the adult. A: I am working on a book set in England mainly during the Second World War and its dreary aftermath. England is not Venice but the shabbiness I described in A Man of Genius in Venice is multiplied many times over in postwar England. Through a single character I want to investigate how people coped not so much with the war as with the end of war. A: While writing and publicising A Man of Genius I’ve been drawn back into my biographies of Mary Wollstonecraft and her children Fanny Wollstonecraft and Mary Shelley, all of whom in different ways suffered from tormenting relationships. When writing these biographies I felt in the presence of modern women with whom I might imagine changing places—and whom I had the presumption to think I understood. The culture has much changed of course but they were writing in now recognizable self-reflecting modes. But before these biographies, I wrote one of Aphra Behn. With her I felt in the presence of a quite different sort of woman and a very different cultural time. Although written 20 years ago my biography still stands I think. It is both factual and speculative, which fits well with the new type of biographical writing. No one has written another biography in these two decades and no new “facts” about Behn’s life have come to light. I am therefore hoping to republish this book as a paperback very soon, with a new introduction. I am an immense admirer of the amazing Aphra Behn. In my view Jane Austen and Aphra Behn are the two most experimental and innovative early women writers in English. Behn was not only a major dramatist and fiction writer, but also a spy and an openly bisexual woman. I want everyone to know about her!